Happy Anniversary Lindsay & Christian! Lindsay & Christian were married eight years ago today at the Historic Trinity church in Detroit, with a Grosse Pointe War Memorial wedding reception to follow. Congratulations you two on eight years! We love planning weddings at the Grosse Pointe War Memorial! It is a beautiful setting right on the water, and the staff is phenomenal. Grosse Pointe residents and military descendants have priority when booking dates, but they do allow other couples to marry there as well. We plan outside ceremonies on the grounds, or coordinate ceremonies nearby at a local church or other venue. There are rooms for small receptions as well as a much larger ballroom for a grande affair! You might be wondering where to stay for a Grosse Pointe wedding? Most couples book hotel blocks in Detroit and shuttle guests to the ceremony and reception. Once you get everyone there, make sure you also arrange for late night shuttles! This makes the experience much more enjoyable for guests, and if you are serving alcohol, it provides a safe way to get back at the end of the night. Hotel blocks are usually courtesy – which means you don’t have to guarantee rooms and they get released back into the general inventory if not booked within 30 days of the wedding. If there are major events in town, there might not be courtesy blocks available. Make sure to check the local calendar! You can always call the Detroit CVB to inquire about events. If you or your partner are in the military, make sure you ask about discounts! 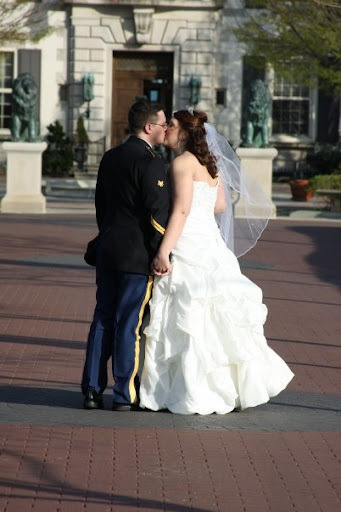 Many wedding professionals and venues do offer a military discount as a thank you for your service. Also be sure to check their policy on changing the date in case of deployment – some policies are more lenient than others!